Billericay Town slumped to their first home defeat of the season losing 3-2 against Oxford City. After taking an early lead through Jake Robinson, the Blues succumbed to a 16 minute three goal salvo either side of half-time from the visitors. A late strike from Ross Lafayette proved to be only a consolation. On a mild but damp December weekend, Blues fans gained their first sight of the team in the League since news broke of the club’s decision to move to full-time status. The change in training schedule had seen record signing centre-back Dean Inman depart the club in the week for Step three side Kingstonian. Crowned Player of the Month on match day by the supporters’ society (BTSS), Inman’s absence left a huge gap at the heart of an injury hit defence. With further departures anticipated, the transition period to the new structure may prove to be tough to negotiate. Timing for such a move mid-season looks questionable if results are adversely affected. Town’s main questions on team selection versus Oxford City revolved around the defence. 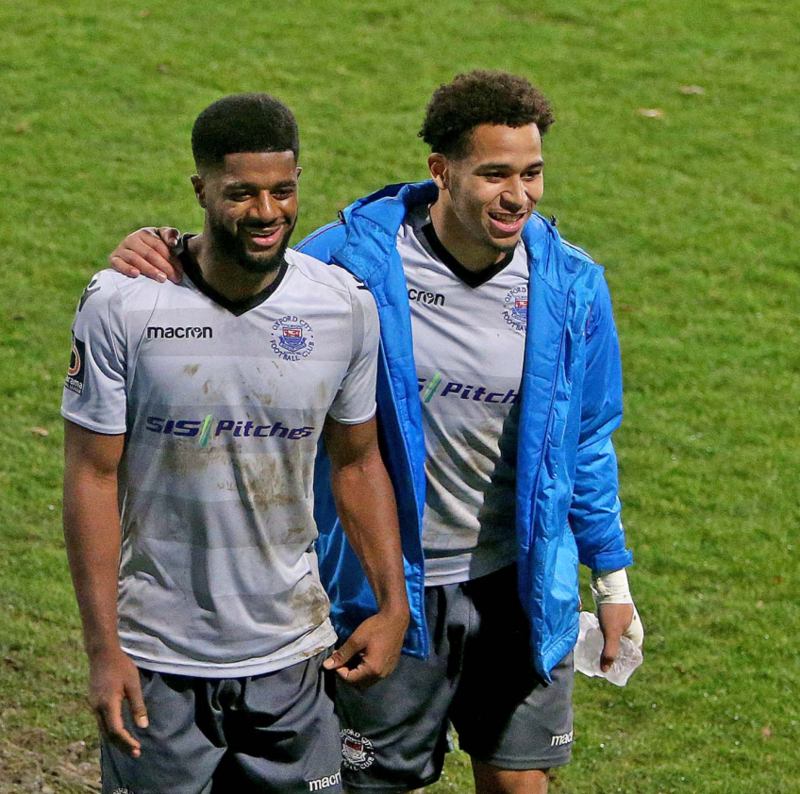 With central defenders Scott Doe unfit, and Rickie Hayles only able to make the bench after a hamstring strain, the Billericay back line had an unfamiliar look. In came 21 year old Colchester United loanee Paul Rooney, signed on Friday, to make his full debut. A more familiar face, midfielder Danny Waldren, was chosen to complete the centre-back pairing. In the only other change relative to the FA Trophy match at Hampton & Richmond last weekend, Lafayette came back into the starting line-up to partner Robinson up front. From an attacking role, Moses Emmanuel dropped into midfield. Billericay started the match strongly, threatening the Oxford goal with breaks from the left hand side. One such incursion would see a Rooney pass serve Sam Deering in space on the right hand corner of the penalty area. In the 2nd minute, Deering’s curling shot was pushed out by Oxford goalkeeper, Craig King. The rebound, which fell into the path of central midfielder, Billy Clifford, was rolled wide. Deering remained heavily involved in the best home passing moves and regularly shifted the ball wide to launch attacks via overlapping right-back, Joe Kizzi. It was only due to solid defensive work from Oxford’s left back, Ben Jefford, that Kizzi did not enjoy more success as several important blocks were made to prevent crosses. Despite exerting firm control in midfield, and pinning City back in their own half, the best chance fell to the visitors on 11 minutes. Zac McEachran, operating in an attacking role, found space on the right to pick out, Kabengo Tshimanga. Unmarked at the far post, the ex-MK Dons youngster, could not untangle his legs from the ball and, by the time he could direct an effort on target, Alan Julian had time to save his effort. Playing as a lone striker in City’s preferred away 4-5-1 set-up, Tshimanga was a lively presence and full of confidence after an impressive recent FA Cup hat-trick away to National League, Tranmere Rovers. Somewhat isolated in the first half as Oxford showed limited attacking ambition, he benefited from stronger support after the break. After avoiding going behind against the run of play, Billericay took the lead on 15 minutes. A Callum Kennedy corner from the right side was hit hard at waist hide to the waiting Kizzi. The Blues defender side-footed the ball powerfully towards goal from 12 yards. 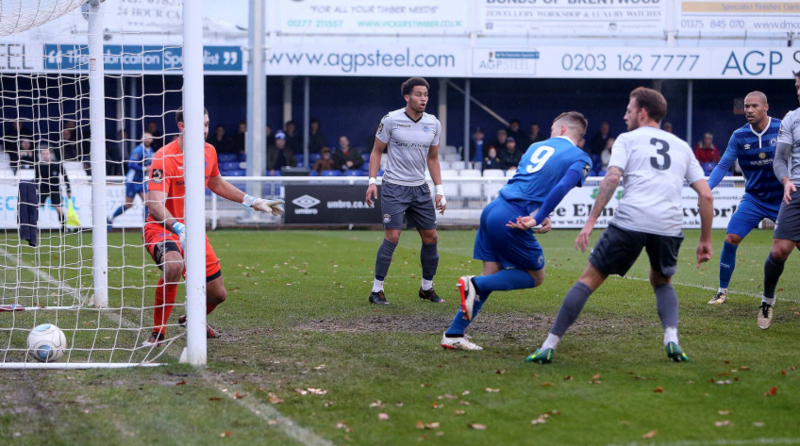 With most in the ground crediting Kizzi, Robinson showed his “goal-poaching” skills to successfully claim a touch to register his 13th League strike of the season. Blues continued to exert pressure with several fine runs forward from Rooney, and regular forays forward by Kennedy on the left, yielding a number of free-kicks. Rooney looked impressive striding out of defence and cleverly distributed the ball in an eye-catching debut. Home dominance saw Deering shoot wide and Lafayette fail to connect with a centre fired across the six yard box. Best chances for Billericay were two penalty shouts for handball against Oxford players. In particular, the second appeal against Kyran Wiltshire, who appeared to raise his arm above his head, looked worthy of the referee’s attention. As half-time approached, Oxford secured an equaliser with only their second attack of the match. A misplaced pass from Lafayette saw City gain possession on the left hand side. McEachran, the driving force behind Oxford’s creativity, advanced forward and played a pass inside to find Kyran Wiltshire in the Billericay penalty area. Cutting inside, the winger sent a precise right foot shot into the far corner of the net. Once level, City wasted no time in taking the lead via a 47th minute inswinging McEachran corner. The ball looked to have brushed the head of Billericay’s Lafayette on the way in as he sought unsuccessfully to clear. With the goal claimed in a post match interview by the smiling McEchran, we doubt the Blues striker will want to take it off him. What is not in doubt is that Deering could not prevent the ball crossing the line at the far post for the Oxford goal. It soon became worse for the home side as McEachran played a clever through pass through the Billericay defence to midfielder, Jack Self. The recent arrival at Court Place Farm from Banbury United hit a left foot shot that Julian did well to save. The loose ball fell to Tshimanga who struck his effort against the far post. With no home defenders around, San Nombe made it third time lucky, hitting home powerfully from 10 yards. On 59 minutes, the Billericay manager, Dean Brennan, replaced Clifford and Waldren by bringing on Ricky Modeste and Hayles. The Blues started to wrestle back control of the game and create chances. On 72 minutes, Lafayette reduced arrears with a powerful close range finish after his initial strike at the back post had been well saved by King. 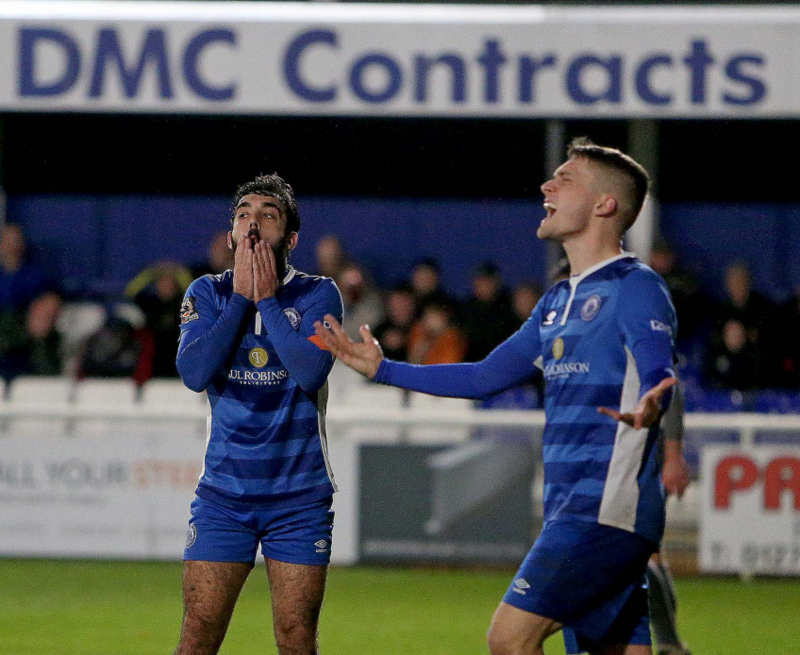 Billericay pushed forward but further opportunities to restore parity were limited. Robinson shot narrowly over and Lafayette narrowly missed connecting with a cross at the far post. Blues best chance to equalise came in stoppage time after good work from Robinson. His well-struck shot from 12 yards look destined for the far corner until the diving King pushed the ball out. A disappointed home crowd were left to reflect on a performance that was very encouraging at times but ultimately ended in defeat. Defensive changes and, after going behind to a freak second goal, a lack of discipline in retaining team shape proved costly. Positive changes were made but a strong finish was not enough to secure a point. 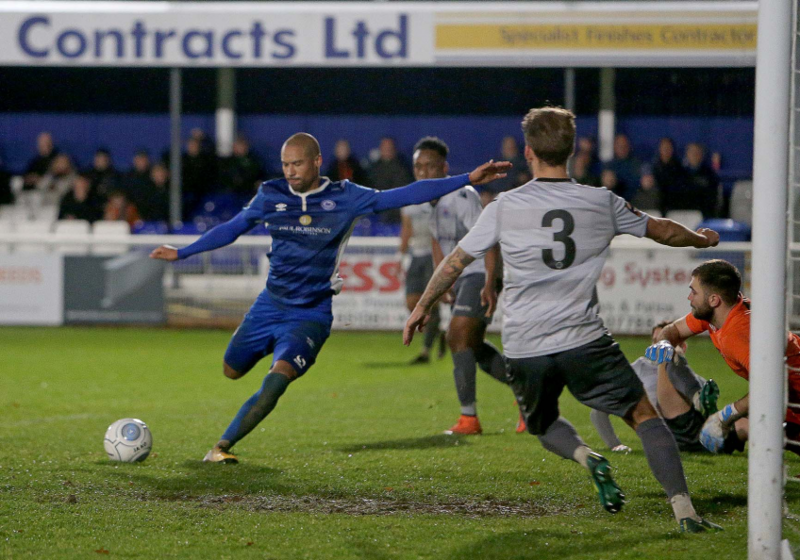 With teams closely packed at the top of the National South League table, Billericay drop to 4th place and need to get their campaign back on track next week away to Eastbourne Borough before the big test at home to pace-setters, Woking, in the Blues’ next home League game on December 22nd.